BBC Broadcasts 1936 and Florida University Recital 1959. Previously unpublished. From 1949 to 1959 Dohn�nyi taught at Florida State University while he and his third wife became American citizens in 1955. The following year he was invited to perform at the 10th Edinburgh International Festival where he played his Piano Quintet No.2 in E flat minor, Op.26 with the New Edinburgh Quartet, gave a recital with violinist Alfredo Campoli, performed his popular Variations on a Nursery Song with the BBC Scottish Symphony Orchestra and Ian Whyte, and gave a short solo recital of his own piano compositions: all this at the age of 79. 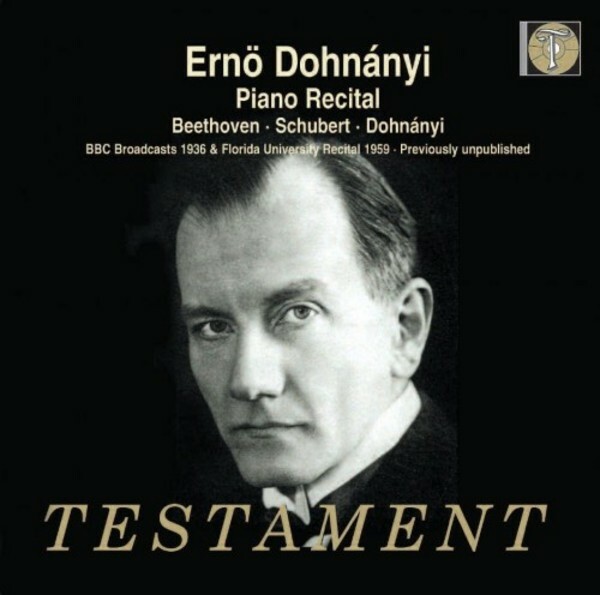 Dohn�nyi�s piano music makes one think of a style that is a cross somewhere between Brahms and Medtner and his own performances are extremely revealing when compared to the scores, as the printed notes seem to be just the starting point for Dohn�nyi. At the end of his tenure at Florida State University Dohn�nyi gave a recital that was recorded by the Student Radio Group. He was 82 years old at the time and there were two sonatas in G major on the programme � Op.31 No.1 by Beethoven and Schubert�s magnificent D.894. The three encores were all compositions by Dohn�nyi himself, the first, Scherzino, comes from a group of Six Pieces, Op.41 that was written in 1945. The March is the first movement of the Humoreske in the form of a suite, Op.17 which he wrote more than fifty years before in Berlin in 1907. Dohn�nyi begins his performance with two bars of the left hand ostinato not found in the score which he then cleverly develops in enharmonic passages over the unchanging bass figure. The final encore, which he announces himself, is also from Six Pieces, Op.41. Listening to the brilliant, cascading figures, the evenness and control of his playing, it is hard to believe that we are listening to an 82-year-old at the keyboard. It is obvious that he loved to play the piano and retained the technique to do so right until the end of his life. Indeed, his last studio recording was made in January 1960 for Everest Records barely a month before his death in February of that year.